My husbands Father lives in Mevagissy, Cornwall, as such we do like to pop down and see him. 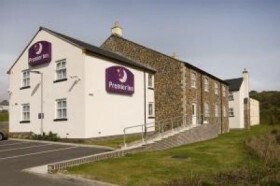 We cannot stay with them as they only have a small bungalow and could not cope with us staying, other years we have stayed in local bed and breakfasts, or hotels both of which were not cheap, 18 months ago premier Inn open about 2miles from St Austell which is about 5 miles from Mevagissy. We drove past it as they were building the hotel, fantastic position on a hill top looking out to sea over the bay. I subscribe to Premier Inn to get all there updates of special offers, so when they offered this new hotel at £29 per room I very quickly booked a two night break for us. The hotel had that lovely new feel to it, clean, decoration all crisp and fresh, the rooms large and spacious. We had a choice of pillows and a huge bed, the staff were also brilliant, when we asked if we could get more tea and coffee for our room the lady on reception gave us a small carrier bag full, we could not fault it at all.